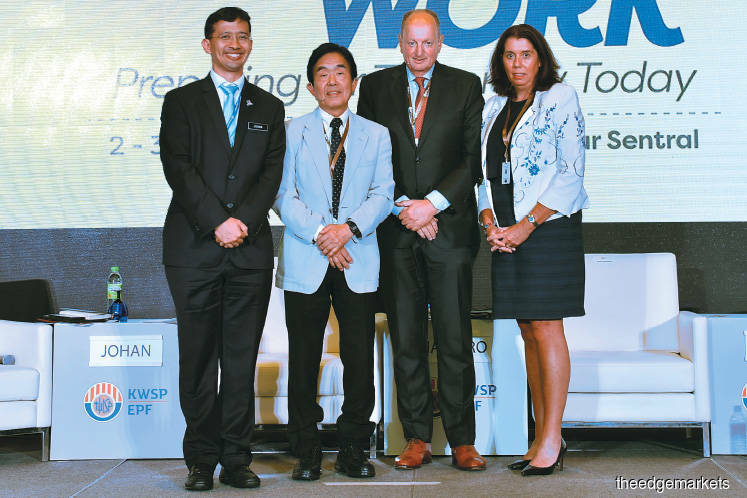 Pension funds worldwide already face the challenge of providing for ageing societies, but the situation may worsen with potentially less contributions from a new generation of workers, according to speakers at the recent International Social Security Conference 2017 organised by the Employees Provident Fund. The weak economy, globalisation and the prevalence of freelance jobs are some factors that have brought about lower pay and financial instability among the young, thus threatening their ability to contribute to national pension systems. While Malaysia has yet to arrive at this stage, this phenomena has already been observed in Japan, says Professor Naohiro Ogawa, chair of Old Age Financial Protection, Social Security Research Centre, Universiti Malaya. “In Japan, [the average] earnings [of workers] are falling in real terms because many companies decided not to hire people on a permanent basis as they have to compete with companies outside of Japan that may have inexpensive labour, so they economise on the labour cost and offer them [employment] on a shorter basis,” he tells Personal Wealth on the sidelines of the conference. At the same time, the younger generation prefer a more flexible method of working that may take the form of multiple jobs over a lifetime or working in the sharing economy, such as becoming an Uber driver. However, the risk is that an individual’s accumulated pay over a lifetime may not be as high as before, Ogawa points out. Those working in the informal economy also may not pay income taxes or contribute to national pension funds. “Younger people have started having a change in mindset — they don’t work for the same company for the rest of their lives anymore. In fact, 20 years ago, after graduation, most people would stay in the same company, but these days, there is a 30% chance you’ll change your job three years after graduation. Lifetime employment is gone, and income disparity among people has been increasing,” he says. Harry Smorenberg, CEO of Smorenberg Corporate Consultancy, stresses that governments and employers will have to adapt to a world where artificial intelligence and algorithms may replace jobs and people may need to find new kind of jobs in the future. This may take the form of freelance work, which means pension funds may have to reconsider how they collect contributions, says Smorenberg, whose company provides consultancy services to pension funds in multiple countries. Malaysia may face the same problems after its demographic dividend ends in 2029, Ogawa says. The phenomenon is caused by a drop in fertility rate, freeing up more resources for individuals and families, which, Ogawa says, is the best time to encourage individuals to save for retirement. His suggestion is for Malaysia to adopt a basic pension system like Japan. There, anyone who has an address participates in the public pension system. Those between the ages of 20 and 59 have to contribute a fixed amount monthly, and participants can claim benefits for old age, disability or death. Those who have jobs also have to contribute to an employees’ pension insurance system, much like the Employees Provident Fund in Malaysia. “The two-tier system makes up our social security system [in Japan], and I think that’s exactly what this country needs. Among young people, the pattern of work and value of work is changing. If that’s the case, you should really have a broad framework,” Ogawa says. Some programmes that attempt to address the situation in Malaysia include the voluntary Private Retirement Schemes (PRS) and 1Malaysia Retirement Savings Scheme (SSP1M) for self-employed individuals or individuals without a fixed monthly income. Smorenberg believes countries should consider giving all citizens a universal basic income so they have something to fall back on. He notes that pensions worldwide may soon become more similar to personal, long-term savings plans as part of an individual’s personal financial planning, rather than one tied to employers. Fixed retirement dates should also be reconsidered. He says employers will have to take the lead in initiating these changes. Sovereign wealth funds and pension funds can also play a big role in pushing for these changes. Lindsay Wright, head of distribution and co-head of investment management in Asia-Pacific for BNY Mellon, tells the conference that as the biggest shareholder in many companies, pension funds and sovereign wealth funds play an important role. “Large asset owners can be a very powerful force in instituting balanced, long-term capitalism that ultimately benefits everyone, and I think provides greater protection in an insecure world,” she says. She expects the highly uncertain investment environment to continue, so sovereign funds and pension funds should adopt a long-term investment strategy. However, this could present a challenge as the main problem listed companies face is the pressure from stakeholders to maximise short-term results, Wright points out. She has a few recommendations for asset owners, including defining long-term objectives and risk appetites before investing, engaging in active ownership by interacting with investee companies, demanding long-term metrics from companies, and avoiding a situation of buying high and selling low, as well as lowering transaction costs. “Given the increasing uncertainty we face in today’s environment, the rapidly ageing demographics and the fact that the younger generation continue to live longer, it makes what we’re doing in managing money and these funds very important. That’s why a long-horizon investment is important,” she says.